A far-right party’s success in Germany’s national elections on Sunday will need to be handled with dignity, the German bishops conference says. Cardinal Reinhard Marx is urging “verbal disarmament” and says the German parliament (Bundestag) has a special dignity which must take priority in political confrontations. 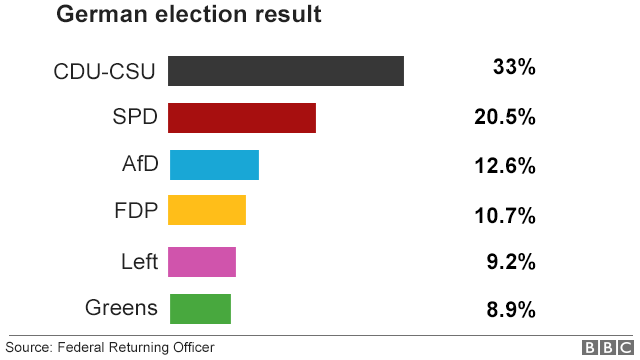 The Alternative for Germany (AfD) is the first far-right party to be elected to the Bundestag since the Nazis were defeated at the end of World War II. German Chancellor Angela Merkel’s Christian Democratic Union-Christian Social Union coalition polled 33 percent against the opposition Social Democratic Party’s 20.5 percent. The anti-immigrant AfD scored 12.6 percent of the vote. Marx says he is concerned about “increasing populism” in Europe. “Nationalism and the desire for demarcation and foreclosure” could not be “combined with the Christian message,” he says. Archbishop Heiner Koch of Berlin is concerned about the way the election results increase people’s “fear of upheaval” in Germany. “These results pose a great challenge for us as a church – we must not give up the democratic struggle for a prosperous coexistence,” Koch says. Support for the AfD, which has vowed to ban Muslim minarets and burqas, and reintroduce permanent border controls, was highest in formerly communist-ruled eastern Germany.